iPad 3 is Just Three Months away So Chill!!!! New information from iPad supply chain makers indicates that Apple is poised to launch the next generation of its tablet device in the next three to four months. The news comes from Taiwanese blog Digitimes, which has previously picked up accurate news from sources in Apple’s supply chain. The report states that iPad 2 production will remain high (14 to 15 million units) in the fourth quarter of 2011, but will decline to under 5 million units in January 2012 to focus on building iPad 3 units. The report also indicates that iPad manufacturer Foxconn Electronics is expected to produce just under 10 million iPad 3 units in the first quarter of 2012. That number would be comparable to the total number of iPad 2 units currently being assembled. 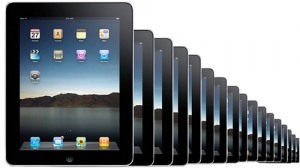 iPad 3 production would begin prior to 2012, with a launch coming soon after. The new information is more aligned to Apple’s past iPad launches, which have been announced roughly about the same time during the last two years. But the first-quarter-2012 timing assumes Apple has resolved possible issues with a new retina display.